Up over the Bluestacks from Letterfad down into the gem that is Glenties. Overview: You'll have enjoyed two good days on the Bluestack Way at this stage, but what comes next is possibly the best part of it. The sight of the pristine and perfectly manicured Tymeen football pitch, the sacred serenity of Disert, the hulking presence of Carnaween, the agony of climbing up Lugnabrogue, the ecstasy of getting to the top and admiring the best view in Ireland, the calmness of Doobin, the surreal sight of a sofa just when you want one and the joy of seeing Glenties are yours to behold - this is one special section. The Bluestack Way is a well regarded waymarked way, but the more I think about it, its a pilgrimage of sorts; a doffing of the cap to generations of people and of ways that are long gone, where determined people lived and exciting (and at times inexplicable) occurrences took place, where the harsh land gave knowledgeable and grateful residents a living and where the epic and ever-changing beauty would make the heart of the most hardened cynic skip a beat. Savour its fresh air, its exquisite scenery, its remarkable stories, its quiet and tacit dignity and its enduring appeal - getting to the top of the Bluestacks is a treat we should all enjoy at some stage on our own personal pilgrimages. Its three kilometres from the Centre to get back on the Bluestack Way – simply turn right and walk past the church taking the right in the fork in the road. The full wonder of what awaits you will become apparent. In days gone by, you would have seen children walking to school around here carrying not only their schoolbags, but two pieces of turf – each child was obliged to do so as it was the only means of heating the local school. The Drimarone area you are walking through had numerous seats of learning over a long time. In 1824 Hedge schools at Ednamock, Selacis and Tullynaha preceded the National schools that followed: Drumnaherk to the south, Lettermore to the west, Letterfad to the north and Ardbane to the north east. Writing in the Drimarone Schools Reunion, editor Peter Campbell opines 'all four schools enjoyed success until the great wisdom of civil servants in Dublin wiped the entire National School system in the area’. Lettermore closed in 1967, Letterfad and Drumnaherk in 1970 and Ardbane in 1972. Campbell notes ‘there have been many changes in the Drimarone area since the National Schools were established; many changes since they were closed. Gone are storytellers and the rambling, the postmen on bikes and the Post Office; the open houses like Emby Meehan’s where the house phone was available to all comers. In its place we have a phone in every house; electricity for everything and we are even producing our own locally on the Blue Stacks. The rambling has been replaced by TV; cars at every house and two at some and the bicycle is now redundant. Everything has changed but thankfully some things stay the same. Walking the Bluestacks is becoming fashionable again’. Gerry had gone to Drumnaherk National School when all around him were going to Letterfad. Years later over a drop of whiskey with his father, he managed to get to the bottom of why this was the case. His ancestors had all gone to Letterfad, but Gerry’s Uncle Packie was a ‘bit mischievous’ and got into trouble with the Headmaster there, Master James Mulhern in the early 1920’s. This became a slight family disagreement with the school and the parents decided to bring the remaining children away from Letterfad. 'Because you normally go to the school of your parents, that is provided you haven’t moved homeplace, I found it amazing that because of some minor incident that occurred years ago, it had the knock-on effect of determining what school myself and my brothers and sisters were to go to, over forty years later and ultimately determine the circle of friends you would hang around with for many years after’. In our first audio piece, we tell about the usage of the word 'wean' also spelt 'wain' for children in these parts - it's derived from the words wee ones. In the second audio piece, Dan Gallagher who went to school on the other side of the mountain recalls his memory of taking the two sods of turf to school and taking the cane. An old saying in Ireland concerning St. Brigid went 'put a green cross beneath your roof on the eve of good St. Bride and you will have luck in your home long past Lammastide. Put a green cross above your door, ‘twill be hard to keep green but it will bring luck and happiness long past Hallowe’en’. Together with local saint Colmcille and national icon St. Patrick, Brigid makes up the trio of great Irish saints, although her sainthood was bestowed by the people, not the Pope. Today, the three saints are buried beside one another in Downpatrick, County Down. Patrick Campbell recalls the making of the St. Brigid rush crosses at home: ‘My grandfather would begin the preparations early in the evening. Taking a hook he cut a bundle of rushes on our land and brought them to our cottage door. It was necessary to do this before sunset. At ten o’clock that same night, the Rosary was said. Every member of the household had to be present as all were expected to give a hand at making crosses. When the prayers were finished, my grandfather went outside and closed the door behind him. Picking up the rushes he had cut earlier he returned to the house and knocked on the door. The door was then opened to him and as soon as he appeared he would say (in Irish) ‘Go down on your knees and open your eyes and let Brigid in whereupon the family replied in unison ‘Sea Beatha’ – she’s welcome. Grandfather then distributed the rushes placing them on the chair of each one present and then the cross making started. When enough had been made, they were sprinkled with holy water in the name of the Holy Trinity. Next morning the crosses were placed over the door of the cottage and in every room and outhouse. The old crosses were collected and burned’. Different designs were peculiar to parts of the country, but all were made with great skill and diligence. Brigid was a 6th century saint from County Louth and was said to possess an uninterrupted communication with God throughout her adult life. In our audio piece, we tell you how this feast day, like so many others in Ireland, replaced an earlier pagan festival known as 'Imbolg'. Patrick Campbell wrote of an old woman with supernatural powers who lived three miles from Meenawilderg. When she became ill, her neighbours attended her, but no matter what neighbour moved her alarm clock from her mantelpiece over the kitchen fire, it would always be in its former place the next morning. After she died, her house remained unoccupied for many years, bar visits from the odd hiker. One German hiker spent a week at Old Lizzie’s cottage. He called daily to the neighbouring house for milk and told of the strange phenomenon he witnessed when he cycled down the lane to the iron gate which closed off the way to Lizzie’s cottage. Each time he approached the gate on his bike, the gate automatically opened; whether he was coming to or going from the cottage, the gate just opened of its own accord. In our audio piece, historian Helen Meehan gives us an overview of Carnaween and Disert which you are approaching. You will be hearing more about both places, both Helen as always has another angle on these phenomena that are worth hearing. The audio piece reflects the sentiment above. We are still hoping to get Michael McGrory's witty ditties onto this app - or Eddie Gallagher, who is referred to in the audio. It is a good 5 km from the Bluestack Centre to the Tymeen Football field which you’ll see on your left. Surrounded by an uneven boggy surface in all directions, this verdant patch is all the more striking – ask the folk in the Bluestack Centre when the next game is on and perhaps you could coincide your walk with part of a game there. Having turned left at the pitch, some 15m along the road, you’ll be turning right into a laneway. 400m down the lane, you will find an old lime kiln on your left. Continue up the lane, following the Bluestack Way signs through a number of gates – please ensure you close them after you pass by. Note the abundance of wild fuchsia. The lane continues for another 1.3km until you reach the sign for Disert Graveyard on your left. Disert is a townland situated at the foot of Carnaween, one of the Bluestacks most iconic mountains. There are many versions of the meaning in Irish of Carnaween - Seoirse's version has it as Place of the Birds for example. 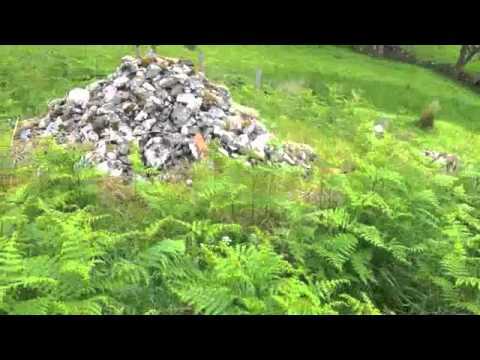 Carn is translated in English as ‘heap of stones’ and Buion means a gathering of people. So Carn a Bhuion may be taken to mean a meeting place for a gathering of people. 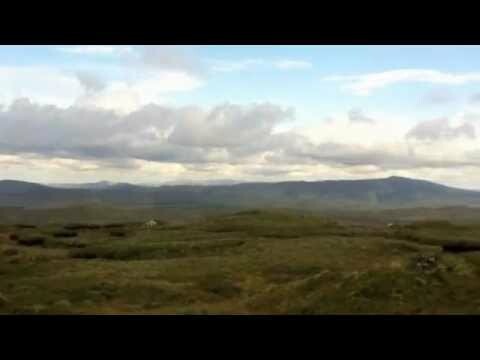 It has been a custom of hundreds of years for people to gather and climb Carnaween every year on the first Sunday of June – maybe dating back to Celtic Ireland when people met to make laws, settle disputes and have sporting events such as the Tailtean Games. Our audio piece gets both John and Patsy's description of this hallowed turf. Come down the brae and at the bottom of it turn left where you'll see the sign for Disert graveyard, going past sheep gates. There's a well worn path to get to the site and more signage. Diseart is the Gaelic word for Hermitage. After St. Patrick brought the Christian faith to Ireland in A.D. 432, it became a custom for men and women to go to remote places to pray and do penance alone and away from the lures and temptations of worldly matters. Between two heaps of small stones and beside a thorn bush there’s a holy well called Tobar Cholmcille (Colmcille’s Well). There’s no evidence even in folklore of when the custom of doing the turas started, but probably early in the sixth century. It is believed that St. Colmcille blessed the well and that the water in it cured toothache and other illnesses. Pilgrims doing the Turas had to say three Our Fathers, Hail Marys and Glory Be’s at the well followed by fifteen decades of the Rosary, while walking around three heaps of stones near the altar, three times around each heap and throwing a small stone on the heaps each time. The water from the well is taken home and rubbed on the offending aches and pains. There is a large flat topped rock near the well presumed to be the altar where mass was offered. On the altar there’s a round stone with a hole in the centre. It is said that St. Colmcille looked through the hole and blessed the surrounding area visible to him through the stone. It is believed that this stone was used as a candle holder during Mass and that there were two but one has been lost. Not far from the Altar rock stand two leaning flagstones about 2.5 feet or 3 feet high with one horizontal flag stone placed across at the top of them, dolmen-like. A pilgrim suffering from back ache had to squeeze through between the erect stones, touching them with his back. Cures are known to have happened in this way. To get rid of an eye ailment, the pilgrim looked through the stone that sits on the altar. The holy well is situated in the centre of the field in a hollow. In times past, people came from far off places to do the Turas. They used to erect tents and remain there longer than necessary. Some of them brought uisce beatha, got drunk, fought and behaved badly. The graveyard was closed and access forbidden to outsiders. Local people kept up the custom however and the method of doing the Turas is still known, exactly the same as from its foundation. In the 20th century, it is known that unbaptised babies were buried there as they were not allowed to be buried in consecrated ground. This probably came down the years from the Monastic system in Ireland which was both rigid and severe. 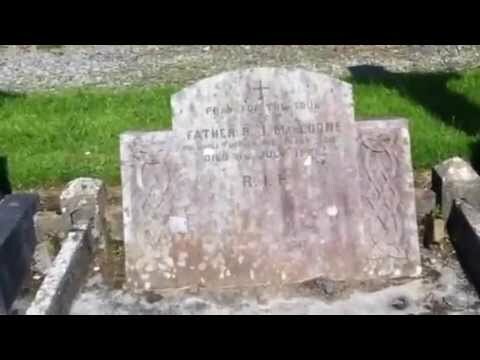 The last person to be buried there was Paddy Neill Ruaire O’Donnell over 100 years ago. The graveyard is now covered with bracken, briars rushes and weeds leaving any traces of by-gone days invisible as you'll see from our video. Mention must be made of the Diseart clay (creafog dhibirte) which is famous far and wide for its ability to banish rats. A local who inherits the gift from his ancestors must take up the clay for the recipient. With only a handful of residents now, this is easier said than done. It is believed that the clay was blessed by St. Colmcille and enjoys the same banishing power of the clay he blessed on Tory Island and Gartan. In our audio piece, John gives a comprehensive description of the customs that occurred in this sacred site. Disert – the area around the wall and burial site at Disert presents a restricted, but interesting flora. Bluebells thrive in the area, even in intensely grazed fields, probably due to the non-application of artificial fertilisers. Thistles are common and are reportedly a favourite food of donkeys no less. Many fields are bracken choked in the summer months, possibly another indication of the absence of artificial fertlisers. Near the parking area on the way to Disert a small stream has incised a deep gorge which has fenced off and contains a stand of hazel trees with a local rich flora of primroses, lesser celadine and wood amemone. Along the road there are also dog violets, foxglove, wild strawberry and various fern and moss varieties. In our audio piece, John tells us about how this area coped during Famine times. Make your way back through the fields to get back on the road. You’ll be turning left and carrying on down the road for some 300m before turning right. Follow the tarred road for approx 1km where it turns left through a gate onto an unsurfaced track. This track turns under a steep rock face on the side of the mountain to an old fashioned ruined homestead cottage, marked by a large Sycamore tree and old Fuschia hedges. This in turn is overshadowed by impressive cliffs lined with Rowan trees. In our audio piece, Helen Meehan explains why Disert declined as a place of regular worship. Here you are faced with a choice of routes; one, the main Bluestack Way traverses the mountain of Loughnabrogue, before crossing the Bluestack range to drop into the valley of Doobin (pronounced Dibbin). This is a route for experienced walkers and safety is of paramount concern. Appropriate weatherproof clothing and stout footware are essential. The route is well marked with waymarked posts and also has larger posts to navigate ‘line of sight’. These are large posts 6-7 feet high with tops painted yellow. These are meant to guide the walker along the route of the walk and are interspersed with the regular posts, either freestanding or attached to the posts of the fence that crosses the mountain and forms part of the path. The other route (Alternative or bad weather route) is a gentler walk that does not cross the mountain and joins the main Frosses to Glenties road (R262) just below Binbane mountain. It follows the road and re-joins the main Bluestack Way at Ivy Bridge and proceeds to Glenties. This is the toughest part of Bluestack Way. Stick closely by the Yellow man markers. The terrain is wet and uneven with large clumps to overcome which are a result of turf cutting from many years ago. In our audio piece, John tells us what to expect. Carnaween is composed of quartzite. A major fault trends along the lower slopes of the mountain and joins the Boundary Fault. This fault trends southeast to Killybegs where it caused a weakness in the rocks that the sea exploited to form the natural harbour, which gives rise to Ireland’s major fishing port. In a double audio piece, John and Patsy tell us more about the great mountain and how it united the people of the Bluestacks once a year. The view from the top of Lughnabrogue is one of the great treats in life. Everything that is magnificent and epic about the north west can be saluted from this point, with you as lord or lady of all you survey. With views as far south as Cavan to one side and Mayo to the other, the hills of Fermanagh and the serene behemoths that are Ben Bulben and Slieve League sit on opposing sides of Donegal Bay like two gargantuan sphinxes. On the north facing side, you get to see Slievetoohey, Meenacurrin, Maghera caves, Loughros Bay, Arranmore Island, The Rosses, Errigal and the Derryveagh mountains. Feel free to let out a roar as this scenery deserves nothing less than a primal scream from those lucky enough to witness it - it doesn't get much better than this. In our audio piece, John tells us what parts of the country you are viewing. You'll be carrying down the mountain. Once you get to the pathway, you'll be turning left following the course of the Owenroe river. If you were to turn right and walk for four miles, you'd be in the heart of the Croaghs. It was from conversing in their native language with the people of this area that he first became interested in weather forecasting all those years ago. As he says himself: -'Most of the people from na Cruacha could forecast the weather accurately for a month or a season in advance and even a year ahead at times. They had such a knowledge of nature, learned from their daily struggle with the elements that they believed each feature of God's Creation was linked by them with climatic conditions. The knowledge of what we call 'book learning' was sparse but they had a rare wealth of lore and wisdom that was a source of amazement to all who came in contact with them. These, coupled with their natural vitality, enabled them to eke out a fairly comfortable living for themselves on their mountain farms in a remote area without the benefits of modern equipment. Observing the animals around them, the folk of the Croaghs would tell you that a dog eating grass was a sign of a change in the weather, that a fox crying on a Winter's evening is a sure sign of heavy snow coming, that the crex crex cry of the curlew is a sign of rain as are crickets singing behind an open hearth fire. Folk here were able to ascertain accurate forecasts from the stars, the sun, clouds, damp, echos, mist, pains, thunder and trees. Curious terms such as 'the peck' and stacked jam jars in windows were other unorthodox methods of forecasting. Find out more about the amazing lost skills of this area by visiting Michael's website and buying his wonderful book online. If you were to turn right after Lughnabrogue and Cloghmeen Hill and carry on past Carnaween, you'd be going in the direction of Meenalig by the Reelan river. While the turf fire bright kept up the light in dear old Meenalig. Look towards the heights of the Grey Mare’s Tail and the lofty hills of Schruel. From Legan on through Golands, and back home to Meenalig. Down through Lough Foyle with a weary heart and back to Uncle Sam. In our audio piece, postman Michael Gallagher about the passing of things in the Meenalig valley - in this case the last time he'll see sheep been taken up the mountains. After your descent, you drop into the valley of Doobin joining the roadway at the bottom of the hill and taking a left turn along the track to Glenties. With no habitation and little disturbance, the occasional glimpse can be had of the peregrine falcon and merlin; more rarely the hen harrier ranges across the mountains. The golden plover is also found on some of the slopes here but more commonly, the familiar call of the stonechat frequently breaks the silence as it hops along the fencepost. Other birds of note are the wheatear, skylark and the ever present meadow pipit. The track follows the course of the Owenroe river which has its source in the townland of Croankeeran on the northern slope of Carnaween mountain approx 4 km to the east. When in spate this river can be spectacular during wet spells and provides plenty of interest where it runs over the rock outcrops, with small waterfalls and many rapids. This river is framed by this beautiful valley deep inside the Bluestack mountains. A rock known as 'Carraig an Tabla' on the north side of the river was said to be used as a mass rock during Penal Times. We tell you some more about mass rocks in our audio piece. This point marks where the Alternative route rejoins us - ensure you follow the signs to the right to get to Glenties. Following the track down to the site of the old school, turn right over the concrete bridge and take a left turn through a gate 1km further on. In our audio piece, John tells us one final anecdote about the area's most famous visitor, Fionn McCumhaill. Doobin, which needless to say is pronounced Dibbin, is the remotest point of our journey. Now with sheep the only permanent residents, this place once had a community as the derelict national school will testify to - built by the indefatigable Canon McFadden back in 1912. The valley had ten households in 1833, thirteen in 1857 and by the time of the Census of 1901, some eight families were registered as living in the area, mainly involved in agriculture with the exceptions of a seamstress and a sprigger. The national school closed as late as 1969 with the last family moving out in 1984. With Glenties over five miles away and Drimarone a mountain away, this place really was far from the madding crowd. In our audio, John guides us down into the barren Doobin valley. You are now approx 7 km from Glenties; known as the Cosan, this path has been used by the people of Doobin for centuries going to mass or to the fairs in Glenties for shopping. It was used by the people of Disert, Drimarone and beyond for the same purpose, crossing over the side of Carnaween by Carn Lough. Sheep were frequently driven this way to fairs in Glenties up until the 1950s. Many would drive sheep the night before, always assured of a bed for the night and shelter for their stock in the households of Doobin. You are truly in the middle of nowhere right now - you'll come across an abandoned sofa that should be enjoyed. The Cosan to all intents and purposes has been conjured up by a mischievous Samuel Beckett - a seemingly never-ending bog road that goes into infinity; the sofa one last luxury before you embark on this challenging terrain. Some left field theatre company may well stage 'Waiting For Godot' here some day! Our audio piece keeps with the bog theme in telling us what the expression 'bogging' means. Use with care! I looked into her gentle eyes; she blushed and cast them down. I touched my lips upon her hand, still Rosie did not frown. Our audio piece has local Seumas Gildea telling us what he thinks of Irish poets from McGill to Heaney with his trademark candour. Patrick MacGill was born in the Glen of Glenties in 1889 and was the first of eleven children. After only a few years’ schooling and after having worked on the home patch of land, he set out at the age of twelve, one of a group of youngsters from the locality, for the hiring fair in Strabane and worked as a servant boy in Tyrone. MacGill’s literary career began in 1910 when he asked the Derry Journal to print some poems. At that time he was working as a plate-layer on the Glasgow- Greenock line of the Caledonian Railway Co. Shortly afterwards he moved to London and had “Children of the Dead End” and “The Rat Pit” published. They became best sellers. He wrote more novels, some with an Irish setting and some located in England, but never again did he achieve the intensity of these two novels which really form a single work. Since 1981, an annual Summer school has honoured his name - see the VIP hotel for more on it. And their path is of prosperity. In our audio piece, John, who works in Glenties, tells us about its proud heritage. From the rock outcrops at the top of the hill, fine views can be had of the glens with the town nestling quietly below. In the valley, the Owenea river flows from east to west passing Glenties on towards Ardara to enter the Atlantic ocean. To the right is Lough Anna from where the town gets its water supply. it is said that the monks used to have a resting place on an island in this lough whilst ministering to their flock in this region. Standing on the ridge before this descent into the valley, take time to look at the rock outcrops which are part of an interesting geological feature known as Appinites. The hills immediately south of Glenties are made up of an igneous rock called appinite (after the Appin region in Scotland where these rocks are particularly abundant). These rocks are part of the fiery geological history of Donegal. At the culmination of the continental collisions around 410 million years ago, vast volumes of hot magma rose through the crust to cool slowly within the metamorphic rocks already present to form granite. Donegal contains ten large granite masses, one of which named Barnesmore granite is seen at Barnesmore. Slightly earlier, but intimately related to the large granite masses that make up much of Donegal, are the much smaller appinite bodies that can be seen here. The Appinite magma was generated by melting rocks deep in the Earth's interior, termed mantle rocks. It is thought that the special conditions that are often present near the end of continental collision are necessary to create the magma. The magma then rose and cooled, crystals started to form and were carried along with the rising magma. Among the earliest minerals to crystalize were a greenish black mineral called hornblende which in places nearly entirely makes up the rock. As only minor amounts of white feldspar crystallised with the hornblende, the rock is very dark in colour. The shape of the hornblende crystals indicates that they formed extremely rapidly from the magma. With certain crystals constantly being crystallized or extracted from the magma, the residual magma constantly changes and becomes less voluminous. This can mean that rock that forms from the magma early on can be completely different from the rocks that form later. In the Appinite just south of Glenties later batches of magma have intruded rock that formed much earlier (hornblende-rich rock) in the form of thin criss-crossing veins. These later veins stand out on the rock surface. They are light-coloured because they are made up almost entirely by feldspar with minor amounts of other minerals. These veins probably represent rock that crystallised from the last fraction of the magma. Many examples of these rock formations can be observed on the hills towards Glenties. In the audio piece, in what will be our last direct view of Loughros Bay and the Atlantic, we tell you of the legend of Hy Brasil that is off in the horizon. According to Michael Gallagher, sheep are often regarded as being downright stupid, but they actually notice changes in the atmosphere early on, and set out to prepare themselves for it. When in late autumn, winter or early spring, they gather together and jump and play as if showing their prowess in athletics, snow is in the offing. Again when they keep close together or run in formation to a high ditch, a hedge or old wallsteads, high winds are fast approaching. In late spring, sheep in lowlands head back to the hills and can make their way to the particular pastures they inhabited the previous summer. They’re leaving the lowlands as an indication that the harsh winter and spring have ended and good weather is on the way. If the shepherd forces them to go to the mountain in the spring against their wishes, they will invariably return to the lowlands as they realise that more harsh weather is to come. If the sheep on the hills head for the lowland pastures at the fall of the year, harsh weather with storm, hail or snow can be expected in the near future. Our audio piece might just be the best one recorded along the way - featuring as it does some very vocal sheep and two knowledgeable sheep farmers! Nestled between two glens on the north westerly edge of the Bluestacks at the convergence of two rivers, Glenties is the largest population centre in the parish of Inishkeel. Surrounded by mountains and hills on three sides that open along the Owenea valley to the Atlantic ocean to the west at Ardara, Glenties is noticeable for its lush tree-covered valleys in stark contrast with the Atlantic seaboard mountain habitats of blanket bogs and moorland on its approach road. The eastern half of Glenties is situated at the Donegal Gaeltacht which is one of the largest native Irish speaking areas within Ireland. Descending the hills, you'll come to your first proper road since Tymeen. Cross this road and continue straight on over a metal bridge that crosses the Owenea river, the waterway you'll be meandering to Ardara with tomorrow. Once you get to the R253 main road, you'll be taking a left into Glenties. Those planning to spend more time in Glenties should look for St. Connell's museum which provides both history of the area and tourist information. Look out for the walk to Owenbhan waterfall above Meenahalla, a sight to behold when in full spate. The contours of Liam McCormack's famous Catholic church built in 1974 reflects the mountainside above it. I’ve seen the hopes of childhood stifled by the hand of time I’ve seen the smile of innocence become the frown of crime, I’ve seen the wrong rise high and strong, I’ve seen the fair betrayed Until the faltering heart fell low, the brave became afraid- But still the cry comes out to me, the homely voices call, From the Glen among the highlands of my ancient Donegal. And often in the darkness,‘t is myself that sees it all, For I cannot help but dreaming of the folk in Donegal. So I’ll hie me back to Glenties when the harvest comes again, And the kine are in the pasture and the berries in the lane, Then they’ll give me such a handshake that my heart will leap with joy, When a father and a mother welcome back their wayward boy. So I’m going back to Glenties when the autumn showers fall, And the harvest home is cheery in my dear old Donegal. Our audio piece has local Seumas Gildea tells us about the early McGill festivals he remembers. Glenties is commonly regarded as being the mythical village of Ballybeg in Donegal that playwright Brian Friel has used in a dozen or so plays, where his real life aunts and uncle lived in the 1930s. Just before we get into Glenties, there's a story for all theatre buffs - look at the graveyard on your right. See where the real life Fr. Jack who went 'native' in Africa is buried. Listen to the video clip to learn how the Catholic church had their own way of showing their distain for a shepherd wandering from the flock. Glenties is special enough in real life, but the fact that this is where some of the greatest drama of the last 50 years is based gives it an added lustre. Unlike the house on Dublin's quays, which Joyce never actually set foot in but in which he placed the action in 'The Dead', Friel knows this area well: he's attended three of the festivals that are held here in his honour and, with a deceased uncle in this grave, there are events etched in his mind that go beyond fiction. 'A community that celebrates a local writer does two things. Rightly, and with pardonable pride, it participates in the national/international acclaim. And rightly, and indeed as importantly, it celebrates itself because the writer is both fashioned by and fashions his people. In our audio piece, John McGroary tells us a bit more about the MacGill Summer school. Carry on along the main road into Glenties. Coming down the Brae, you'll see the Highlands hotel in front of you across the road. The Highlands hotel does a number of things very well - it has a steak that would feed a family of twelve, it has a very congenial staff, comfortable rooms, an artistic vibe reflected throughout and a whole host of female hostesses (seven sisters I believe). As such, it is an hotel worthy of note, but come the high Summer, it really takes off for it is here that the heartbeat of political debate takes place every July as part of the MacGill Summer School. News-starved reporters looking for stories when the Dail is not sitting know that the place to be is Glenties. All manner of headline stories emanate from this hotel and all the movers and shakers from the Taoiseach to the vacationing cognoscenti will glide through its doors. Oh, but do not think you can simply book a room months in advance - it doesn't work like that and the owners have an unorthodox understanding with the festival director, local-boy-made-good, Joe Mulholland, in keeping rooms 'available' as last minute changes in the agenda are de rigueur. Learn a bit about how Ireland got itself into the current situation and maybe enjoy some great human watching too. Never a dull moment. Our audio piece is a tour de force from local resident, Breesy Willow, who explains in her own inimitable fashion what makes Glenties and the Highlands hotel special. There are many reasons why Glenties is on the map for the discerning traveller, but at the time of writing (2012) and no doubt for many years to come, the biggest deal has to be that it produced Donegal's finest son, Jim McGuinness. We've marked where his family still have a cafe in town. Jim managed to guide the Donegal Senior Football team to victory in the All Ireland final of 2012. An anthem that has been adopted for the team declares that 'Jimmy's Winning Matches' (look out for it on YouTube) and indeed he is. You will see pictures of him festooned around the town - his passing resemblance to Che Guevara has given rise to one famous picture of him complete with beret and goatee beard and the motif 'Until Victory Always' that can be bought as a T-shirt in the Highland hotel (where the artist works). And yet, Jimmy had been rejected for the top job on three occasions in the past, only getting it when he'd shown his pedigree as Under 21s manager. A trained sports psychologist, on both paper and in deed, he was the right man at the right time. 'In the last lines of the play, the narrator Michael tells us that when he remembers that summer of 1936 everybody seems to be "[d]ancing, as if language had surrendered to movement...as if this ritual, this wordless ceremony, was now the way...to be in touch with some otherness. Dancing as if the very heart of life and all its hopes might be found in...those...movements. Dancing as if words were no longer necessary." Each of the characters in the play dances at some crucial moment: Gerry and Chris when they meet after a long separation, Father Jack when he celebrates the power of the Goddess, all the sisters when the sounds of the wireless bring them into contact with the outside world. What Michael suggests is that people dance at such moments because dancing provides a way to transcend the painful contradictions, conflicts, and uncertainties of ordinary experience. Dancing takes us beyond the everyday world of language and its ambiguities to a place where our hopes can be painlessly, though fleetingly, fulfilled. If the kites imply the conflicting emotions associated with change, both exhilaration and terror, dancing promises a deliverance from such inner conflict, allowing an experience of undivided happiness'. Yes, it's that good and thankfully Friel has been recently honoured as Donegal Person of the Year by the Donegal Association in Dublin. The play is a remarkable tribute to the Mundy sisters' spirit and from this meagre setting did such a magical story evolve. Try and see the play being performed with a good cast as the Mundy sisters. Meryl Streep can do many things (including outdrinking most people the night she opened this house with Friel some years ago no less), but the film is not a patch on the tour de force that is the play. For the MacGill summer school of 1991 honouring Friel for the second time, the Abbey theatre famously came up for one night only and performed the play in the Comprehensive school you'll have passed by. Friel in introducing the play that night said he was nervous as a kitten being so close to the action from the 1930s. He needn't have worried as the performance was mesmerizing and got a standing ovation. Our audio piece explains what the ancient feast of Lughnasa was all about.